Like the phrase of the writer….a stroke of the brush, the mark of a pencil…thus a story told in color. On my artblog I depict my art as I live it every day. It is a reflection of the ups and downs, the ecstacies and disappointments, and the constant chasing after excellence. For some reason I can’t find your email address in my files – or here for that matter. Just to let you know I’m ill (ongoing but relapse at the moment), that’s why I’m taking a break – and I’ve reduced my pc time because it doesn’t help. So thanks so much for the award and I will respond to it as soon as I’m able. Wow…your art is amazing. I love it all. That combined with food is a winning combination. I find your work very inspiring. I will try to remember and put to practice your good advices for live drawing session. Very good black ink drawings. I’m working on a slideshow on ink and wash, and I decided to include a PDF of people whose work inspires me–I was just going to do a list and links, but Casey got me thinking about including a few pieces of each artist’s work. Would you be willing to be included? 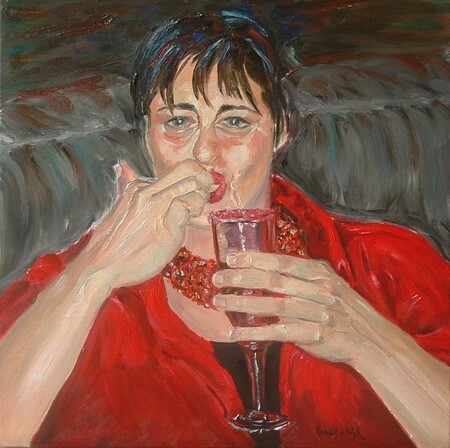 I love this lively, vibrant portrait in red! It speaks of your passion for life! It jumps off the page. This is a strong, wonderful painting! It just absolutely rocks! I wanted to write and tell you about a new website for artists, musicians, fashion designers, and filmmakers: http://www.PutItOn.com. I’ve been using the site as an artist and have my work there, and am trying to support it because I believe in it. Basically, the site allows artists from all over the world to connect, display their portfolios, and sell their work (with NO commission taken!). The site gives artists a FREE gigabyte of space to showcase their portfolios, allows you to stream audio and video works, lets you create live personal broadcasts, and translates any writing into ten different languages. If you could take the time to visit the site, and if you like it too, let your readers know about it, and even sign up yourself or link to it on your site it would be greatly appreciated! We are trying to make a go of helping out artists everywhere and are trying to get the word out, so please help us out if you like the site after checking it out! Thank you! Have just found your site and enjoyed your Paris sketches. It’s an inspiring city to paint in and will add more to my portfolio when there again in May 2010. I will enjoy seeing what you are up tp now and again. Oh i just love it, it’s so great. Hey, you’re excellent without chasing after it! I didn’t know you could do all this, Ronelle. Now all those cute sketches that you always include in your posts on My French Kitchen make sense. I mean, they made sense before, as they were always super fitting. But you know what I mean. Dear Ronell, I am a watercolour artist/aspiring illustrator (sadly part-time, as not confident enough to take the plunge & ‘give up the day job’). I am greatly inspired by your work, especially your pen & ink sketches, loosely painted with watercolours. I am British, and also a Francophile, living on the French island of St Barts in the Caribbean & spent many a long summer in France. I am planning to visit France next summer & looking for an art workshop, or just simply a week painting with an artist (s); I would be very grateful for your advice. Best regards, Rachel. I like your vineyard sketch very much. Do you have more I can take a look. Recently, I am looking for some nice Vineyard Sketch for my new wine label. I apprecial if you can send me a link. I LOVE your work and I’m so happy to find your blog. Your drawing is wonderful and I will come back and take lots of looks. Now I’ll follow! I absolutely love your paintings – so full of life and nature’s colours! Beautiful!!! !